Modern men have an increasingly soft center, and women prefer it that way. The source of the press release? 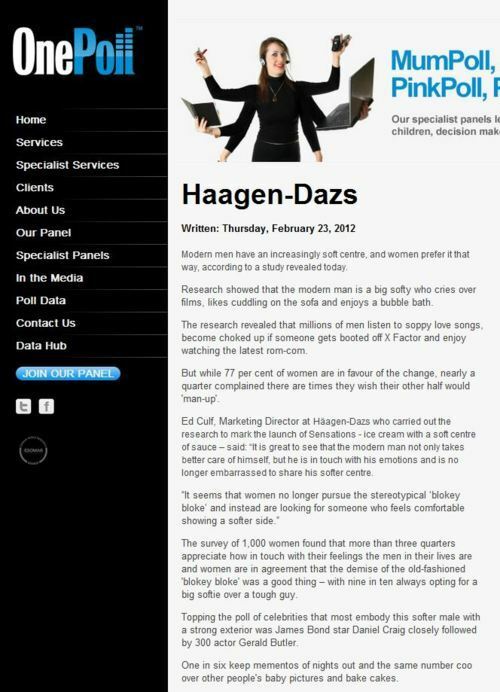 Ice cream manufacturer Haagen-Dazs, who you’d imagine might have a vested interest in telling the tale that men are soppy, soft and doing things traditionally associated with women… such as eating fancy ice cream in front of a romantic comedy. It may well be that men are, in fact, engaging in behaviours that are stereotypically female – there’s no reason for them not to be, after all, if that’s what they want to do. However, without seeing the questions asked by Haagen-Dazs, and without seeing the results of the poll, it’s impossible to tell how genuine any of this information actually is. Yet, with the vested interest from the company behind the poll, there’s a significant reason to suspect the questions may well be biased. In case there was any confusion, here’s the press release on the OnePoll website, which a casual glance shows is perhaps 90% identical to the article which made the Daily Mail. This entry was posted in Uncategorized and tagged daily mail, haagen daas, maysa rawi, men vs women, onepoll, survey on March 8, 2012 by Michael Marshall. Not all nonsense PR stories have to be related to a survey finding that seems shocking or counter-intuitive in order for it to hit the news – the UK press is so accustomed to being spoon-fed the warm-drivel template of ‘shock survey shows us x!’ that they’ll often print entirely-obvious statements as if they were hand-crafted wisdom from the god of science herself. EVERYONE who has ever reached drowsily across to hit the snooze button on their bedside alarm knows the delicious feeling of grabbing those precious few extra minutes under the covers. And they’re not alone. All across the country, the average Briton is putting off the start of the day by almost half an hour. On average, they’ll hit the snooze function four times before finally hauling themselves out to face the world. The lure of the warm bed is, not surprisingly, strongest of all on chilly winter mornings. So, people in the morning like to stay in bed? Even more so on a cold morning? Well I’ll be damned! If you find it almost impossible to get out of bed in the morning, you are not alone. Brits spend almost half an hour each morning with their alarms on snooze, a survey has shown. And more than one in four couples reports arguing over the snooze button and when it really is time to crawl out of bed. Note the author of this piece in the Mail – it’s our friend Maysa Rawi, who you may remember from the ‘Women are fatter than even they realise!‘ story covered elsewhere on this site. Maysa’s own Twitter page tells us she’s the ‘MailOnline fashion editor and blogger’, so that she’s straying from the ‘look what she’s wearing!’ stories to this ‘look what this press release says!’ piece might seem surprising – however, this is the state of the Fourth Estate. With journalists today being required to write three times as much copy per day as their counterparts 20 years ago, it’s far from uncommon to see journalists double-hatting in a specialist role and a general ‘news’ role. So, who originated this rather un-shocking statistic? A poll for insurers Sheila’s Wheels found the average Briton dozes on for 25 minutes each morning in winter, compared to just 17 minutes in summer. We can be sure this story came from Sheila’s Wheels, as it appears on the press section of their site, where we can also see that they hired PR firm Mischief PR, who commissioned this survey via polling company FlyResearch. Of course, the origins of the story aren’t widely broadcast in the original article, as that somewhat undermines the ‘researchiness’ of the case being made. So: don’t snooze so much you forget to lock your doors, or your insurance will be invalidated. Struth. This entry was posted in Uncategorized and tagged daily express, daily mail, jacky brown, May, maysa rawi, men vs women, sheilas Wheels on February 21, 2012 by Michael Marshall.